Doncaster Knights will be looking to avenge a last-minute Championship defeat at Hartpury College back in October in the return at Castle Park on Saturday. But Knights boss Clive Griffiths will be hoping that if they do it won’t be such a close shave for the winners as it was at Hartpury. One Doncaster player, however, is guaranteed a close shave on the day. Record points scorer Dougie Flockhart will have his shoulder-length locks shaved off after the game for charity. The popular Scot, who also doubles up as the club’s fitness and conditioning coach, will have his head shaved by the winner of the raffle held earlier in the day and drawn by the man of the match. All monies raised from the raffle, as well as a 4k run/walk organised by Danum Harriers in the morning, will be donated to the Bluebell Wood Hospice. Entries (£15 adults, £10 under-16s) for the event which starts at 9.30am, have to be made in advance and interested parties are asked to do so by contacting the goal-kicking back on douglas.flockhart@hotmail.co.uk. All entrants will receive a specially designed t-shirt and will receive free admission to the game in the afternoon. “The pupils at the XP School had a competition to design the t-shirt and my wife, who is an artist, picked the winner,” said Dougie. Dougie will donate his hair to the Little Princess Trust, as will the club’s yoga teacher Louise Tuczemskyi who is also involved with the club’s junior set-up. Dougie decided to raise money for Bluebell Wood two years ago after his sister had a cancer scare and has not cut his hair since. 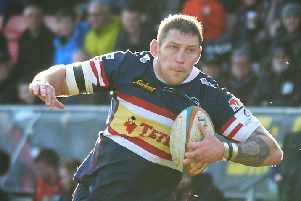 Knights host London Scottish on Saturday.